Many Japanese are more pessimistic than the Filipino. There are several reasons. Of course, this is just a general theory. It’s depends on the individuals. Many Japanese are perfect thinking. Therefore, in school education, it was important to not mistake the answer to a question for a long time. However, no one is perfect in the world. A handful of excellent people will behave without fail but others will make a mistake and regret it. Japan makes high quality products. That is the result of working perfectly oriented of Japanese. But sometimes it works for the worse. In that case the high demands imposed on them hurt themselves. Compared to the Filipino, the unity of Japanese families is weak. Also In Japan, family consisting of three generations were common in the past. But now it is a minority. It is the result of economic development, population has moved to urban areas, nuclear families have increased. Japanese tended to give priority to work rather than family in the past. However, people who does not supported by their families is fragile in mental. In tropical island countries, seafoods and fruits are easily obtained. And if they lost a house to live, they will not die soon. But it is different in cold areas. Now, Japan has become rich but In the past, laziness came directly to death in the past. Even though people are diligent, if the climate worsened they faced to fear of starve to death. Therefore a careful personality or a pessimistic way of thinking was the key to survival. I hear that many Filipino people use lots of salary without thinking afterwards. It is possible only people who live in a tropical country and have strong unity in their families. There is no custom to eating balut in Japan. Most Japanese can not to eat balut. Because They feel balut is so grotesque. Therefore, it is hard to obtain fertile egg of ducks. A limited imported food store sells it but it is not freshly boiled. Please enjoy balut when you return home. Karaoke is originating in Japan. However, not everyone sings. And the place to sing is limited a karaoke studio, pub, or home, not the roadside. Moreover, karaoke in Japan is a little expensive leisure. In many karaoke studios, we need to pay entrance fee per hour and order something to drink. After that it is all you can sing until time limit. There are also many Philippine songs. But karaoke service is also evolving. There is a karaoke service that can be absorbed alone was appear. It’s called ‘Hitori Karaoke’. Don’t you think Champon is a Korean cuisine? Certainly Korean-made Champon is sold at the super market in the Philippines. There might also be TV commercials about it. But, Champon is traditional Japanese food. The birthplace is Nagasaki where famous for A-bomb survivors. “Champon” is Japanese meaning “Mixture.” It is common to have thick noodles, mixed chicken roe soup and pork soup, plenty of fried vegetables, fish paste, cloud ear mushroom and so on. Nagasaki Champon. The meat like Adobo pork is also Nagasaki cuisine. In recent years, Koreans adjusted it to Korean style and sold it. Therefore Korean Champon is pretty spicy, but the original Champon is a dish featuring sweetness of vegetables. You can enjoy the Champon in a restaurant chain named Ringer Hut in Japan. There is no geepney and tricycle in Japan. Alternative transportation is train, route bus, and taxi. Needless to say, taxi fares are higher than trains and buses. Incidentally, Japanese taxi has a automaticaly door. Perhaps if you will live in Japan, you need to walk longer than in the Philippines. Because trains and buses have routes and places for getting on and off. By the way, there are substantial trains and bus networks at near urban areas, but it is not in the countryside. If you consider to live in the countryside in the future, please check the necessary transportation. You may need to depend on someone’s driving. When you live in Japan, you may feel alienation and discrimination. Sometimes a Japanese who is meeting for the first time will observe you from top to bottom. But that is probably just curiosity. Today, international exchanges are increasing, but some Japanese are not used to foreigners yet, because Japan is almost a single racial country. Chinese, Korean, Mongolian are close in appearance to the Japanese, but Filipino people are a little noticeable. Most Japanese do not feel discrimination against Filipinos. However, some elderly people mainly have stereotypes that “young Filipino women are working in pubs”. Because it is difficult for Filipinos to obtain working visas in Japan yet, it has been easier for entertainers. So many Filipino women came to Japan as dancer or singer and then worked as a hostess in a pub. From such a background, if you are a young woman, you may get sexual harassment from elderly men who have not been able to renew their recognition, so let’s avoid it well. Author michiakiPosted on 09/26/2017 Categories CultureLeave a comment on Racial descrimination? I heard that there are overwhelmingly more Christians in the Philippines except for Mindanao island. On the other hand, in Japan the majority are Buddhists. However, the religious mind of many people is mild. They are conscious of their own religion only during rituals such as funerals. There are devout Cristian also in Japan, but it is a few percent. About 400 years ago, many missionaries came to Japan and worked hard in their mission, but there were not much results. One of the reasons is that the regime banned Christianity at the time. They feared that European countries will colonize Japan using Christianity. Other reason may be from the thought of animism from ancient times.Ancient Japanese people were thinking that God would stay in all things. It is called “god of eight million（八百万の神：Yaoyorozu no kami）.” Perhaps it may be close to the expression “nature is a complex god” sensuously. The animation movie “Princess Mononoke” is also based on a similar background. Or it may be symbolized by characters of Dragon Ball. Many characters called God appeared in that manga. Unfortunately, I do not know if it is the same in English version though. Also, the Emperor was worshiped as a god, before the end of the Pacific War. By the way, the emperor’s ancestor is the main character in Japanese mythology. Unlike the multiracial nation of the Philippines, Japan is almost single racial nation. There are a small number of different ethnic groups in Japan. However they usually live like ordinary Japanese. Therefore, You can communicate in standard Japanese anywhere in Japan. Instead, there are various dialects in Japan. These foods are delicious in Japanese autumn. 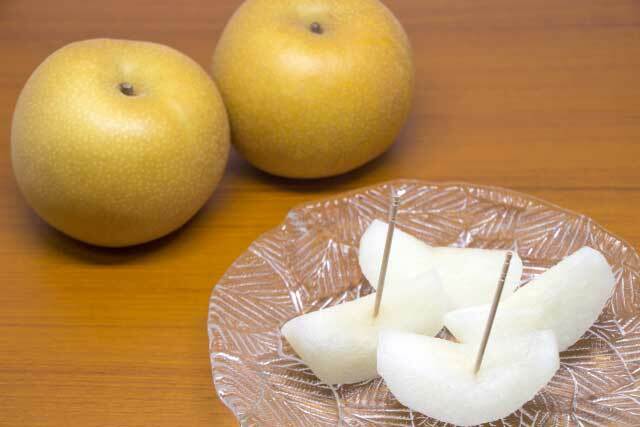 Nashi is one of the representative fruits in Japan. Nashi is kind of Pear. It has high water content and sweet than European Pear. Nashi is e ective for preventation of constipation. You can buy a Nashi at supermarket, It’s about ¥100 – ¥300. 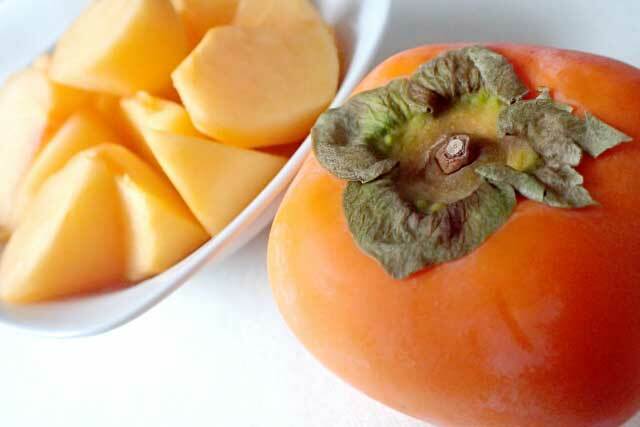 Persimmon is called Kaki in japan. Kaki is fruits of east asia. Especially Japanese Kaki is very sweet and tasty, and rich in nutrition. Recent years, seedless kind of Kaki are sold. You can buy a Kaki at supermarket, It’s about ¥100 – ¥300. 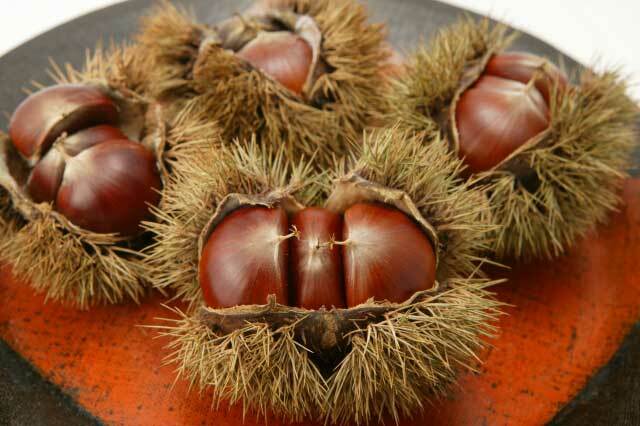 Chestnuts is called Kuri in Japan. Also called Marron in French. Kuri is a delicious tree nuts in autumn. We generally eat steamed Kuri. However many of the kuri sold at stores are made in China. So I recommend Japanese food called “Kuri-gohan”. It’s rice cooked with Kuri. You can buy seasonings with Kuri at the supermarket. Sanma is called Paci c saury or Saury pike in English. Most common cooking is grilled with salt. We eat it with radish paste and soy sauce. The body is delicious but bitterness of the internal organs is best. However, don’t you grill it yourself. Because, when you grill raw fish, a lot of smoke comes out like a fire. 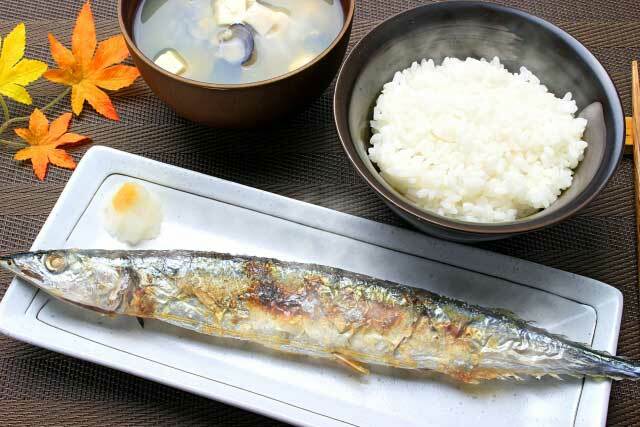 If you want to eat Sanma at your home, you should buy a grilled Sanma, and warm it via microwave, then eat with warm rice. You can buy a Sanma at supermarket, It’s about ¥150 – ¥300. By the way, the act of dismantling the body of the Sanma is a good practice of using chopsticks. Autumn may be the hardest for Filipinos who came to Japan for the first time since spring. Because they will not be accustomed to cold except for people around Baguio. For example, hot and cold days will be mixed in the latter half of September. An effective ways to cold is to wear warm clothes. But autumn is an important period. If summer suddenly changes to winter, no Filipino who just came to Japan can survive. Let’s prepare for the winter using the grace period of autumn.